Spotmau Password & Key Finder can recover lost passwords of Email, MSN, IE AutoComplete,etc, which have been stored on your computer, can find and display product key for any Windows and Microsoft Office software products. Spotmau Password and Key Finder can also find out your Windows system CD Key even when your Windows can't startup. 100% password recovery rate guaranteed! Super user-friendly graphic interface, with just one click. ...... products. You can find out your Windows system CD Key with it even when your Windows can't startup. Support all Windows including Windows 95, 98, 2000, 2003, XP, Vista, Windows 7, NT, and Me. Support 32-bit and 64-bit. Support all Microsoft Office including Office 97, 2000, XP, 2003, 2007, 2010. 100% recovery rate guaranteed! No worry that you may lose your Windows and Office Key. Qweas is providing links to Spotmau Password and Key Finder 2010 5.1.3.0813 as a courtesy, and makes no representations regarding Spotmau Password and Key Finder 2010 or any other applications or any information related thereto. Any questions, complaints or claims regarding this application Spotmau Password and Key Finder 2010 5.1.3.0813 must be directed to the appropriate software vendor. 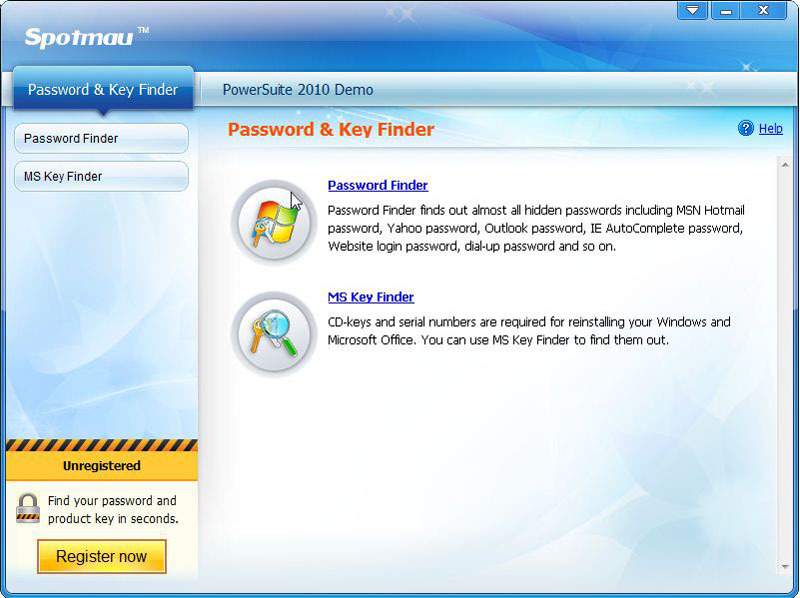 You may click the publisher link of Spotmau Password and Key Finder 2010 on the top of this page to get more details about the vendor.